Many readers have, no doubt, been following the United Kingdom’s Brexit departure negotiations for many months. The Brexit negotiations between the United Kingdom and the EU have been tortuous and very complicated. British Prime Minister Theresa May has agreed to a Brexit deal with the EU and will now be submitting it to the British House of Commons for a vote on approval or disapproval. This post is to offer my analysis of the deal as well as a biblical perspective on the matter. The first link offers a scathing appraisal of the deal by Nigel Farage, former head of the United Kingdom Independence Party and a prime organizer of the Leave side which won the Brexit vote referendum by a 52-48% margin. Mr. Farage regards Ms. May’s deal as “the worst deal in history” as it (A) gives away up to $60 billion pound sterling to the EU, (B) leaves the EU in charge of many rules and regulations inside the UK, (C) keeps the UK inside the EU indefinitely and (D) will only allow the UK to leave the EU if the EU allows it to do so at some indefinite period of time in the future. That last provision utterly betrays the British voters who chose to leave the EU in the Brexit vote. Based on what I’ve read about the deal, The UK would no longer have a vote in the EU itself but would be governed by EU rules on many matters. If any EU rules and regulations are left in force inside the UK after the Brexit date, it surely means the European Court of Justice (the EU’s court) will have jurisdiction over parts of the UK’s internal affairs for years into the future and perhaps even indefinitely. If this accurately represents the deal negotiated by Ms. May, it would essentially transform the UK into a de facto colony of the EU indefinitely into the future. Clearly, the EU would assume control over much of the UK’s future, and the UK would lose many elements of national sovereignty. The second link, third link, fourth link and fifth link offer a variety of other British perspectives about the Brexit deal and its terms, and they also offer their analysis on whether this deal is likely to pass or not. One of the links calculates that in the British House of Commons, the deal would likely be defeated by a margin of approximately 412-226 if a vote took place at the current time. The deal is tentatively scheduled for a vote on December 11. With the Labour Party, Democratic Union Party, the Scottish National Party, the Liberal Democrats and circa 80-90 Tory Brexiteers aligned against the deal, chances for its passage seem dim. However, Prime Minister May will be doing everything to twist arms, promise benefits to various constituencies of their MP will switch to her side, etc. between now and December 11th, so this outcome is yet in doubt. A last-minute snag inside the EU’s own body almost derailed the deal. Spain demanded a side-deal with the United Kingdom regarding the future status of Gibraltar, a long-time British territory guarding the entrance and exit point of the Eastern Mediterranean Sea. Spain has long desired to obtain sovereignty over Gibraltar and remove British rule over that small territory (sixth link). Reportedly, a side-deal was reached which was satisfactory to Spain so it voted to approve the Brexit deal from the EU side. Given Spain’s desire to remove British sovereignty over Gibraltar, I think the House of Commons should very specifically question Ms. May about the details of this side-deal with Spain regarding Gibraltar and ask to see the written document detailing its provisions. 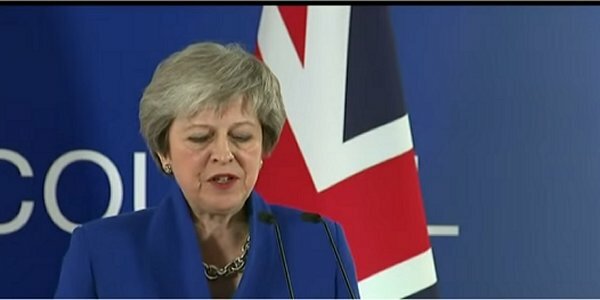 I have little doubt that the planners inside the EU want to use Ms. May’s Brexit deal to eventually transfer Gibraltar to Spain, Northern Ireland to Ireland, make Scotland independent and transfer the UK’s nuclear weapons to the control of the leaders of the new EU military force that Germany’s Merkel, France’s Macron and the EU leaders are constantly trying to create. My own opinion of Ms. May’s deal parallels the views of Mr. Farage as cited in the first link. I think it is an absolutely ghastly betrayal of British sovereignty and interests. Former Prime Ministers Churchill and Thatcher must be rolling in their graves at the thought that a Tory Prime Minister would surrender so much British sovereignty to an EU governing body. Personally, I think it must be remembered that Ms. May was on the Remain side of the Brexit, meaning she did not want to leave the EU! By some odd machination that is incomprehensible to my American point of view, Ms. May ended up becoming the British Prime Minister to implement the winning side’s interests even though she had been on the losing side of the national Brexit vote. I think the outcome of the Brexit negotiations with the EU have revealed she intended to sabotage the Brexit vote from the very beginning by assuming an extremely weak British negotiating position. If the UK had been represented by a strong Leave representative, that person could have given a set of non-negotiable demands (full sovereignty for the UK, no EU rules or regulations left in place over the UK, no residual jurisdiction for the European Court of Justice over any UK matters, etc.) to the EU and simply stated that unless they were agreed to by the EU, the UK would pay “not a farthing” to the EU for any EU purposes after the March 29, 2019 exit deadline. Faced with an imminent need to lay off thousands of EU bureaucrats and de-fund many EU programs if the UK took that position, the EU would have been forced to negotiate in good faith. Ms. May’s government never asserted this very strong British position in the Brexit negotiations. In retrospect, the winning Leave side after the Brexit vote should have arranged to have Mr. Farage appointed as the special British Brexit negotiator with the EU. Then the UK would be truly leaving the EU next March and it would do so with its honor and sovereignty intact. Although the Spanish Armada failed to conquer the British Isles, Napoleon failed to conquer England with its armies and Hitler’s Wehrmacht and Luftwaffe failed as well, it appears that the EU is now poised to conquer the British people with an army of unelected and unaccountable EU bureaucrats armed with briefcases. To avert this outcome, the British House of Commons will have to vote to defeat Ms. May’s document of surrender to the EU when it votes on it in the House of Commons. Now let’s consider some biblical ramifications to this vital matter. Many of my previous posts have focused on the titanic struggle going on in the world between the entrenched globalists and the resurgent nationalists who are steadily growing in strength. Nationalist leaders have replaced globalist leaders in the USA, Italy, Brazil, Poland, Hungary, Austria, etc. Nationalists of varying political persuasions dominate Russia, China, Iran, Egypt, Turkey, Israel, India, etc. Japan tries to walk a balance between the two camps. Globalists still dominate Germany, France, Canada, the EU and the global financial/media institutions. My posts have repeatedly noted that the biblical prophecy in Revelation 17-18 foretells that an entrenched global cabal of governmental and private sector leaders will collapse in the latter days of our age. This cabal of insiders will be incredibly corrupt and will have lined their own pockets at the expense of all others (Revelation 18:2-4). This globalist cabal is sometimes called the global Deep State in the secular media, but Revelation 17-18 reveal it will be overthrown by a cryptic alliance of “seven heads and ten horns” which will band together in the latter days to overthrow the entrenched insider globalists (called “The Great Whore” and “Babylon the Great”‘ in Revelation 17-18). In the Brexit matter, the globalist insiders are trying to bring the United Kingdom into permanent submission to the globalist camp, and Theresa May appears to me to be their “Quisling” inside the UK to implement the will of the globalists. While the Bible’s prophecies indicate the globalists will eventually lose this struggle, we do not know how long this will take to finally occur. The globalists will fight very powerfully to stay in power over the nations, and they will be relentlessly assisted by their allies in the media and the corporate communities. If the surrender of the UK to the EU occurs in the British Brexit vote, it will signal a major victory for the globalists. If the UK’s House of Commons votes this oppressive deal down, it will mean the UK will regain its full sovereignty and it will be a victory for the nationalist’s global alliance. We will have to wait and see which occurs. One last thought. If the British House of Commons approves Theresa May’s surrender deal to the EU, I think they ought to formally change the name of their nation from the United Kingdom to the “United” Kingdom. That change would reflect the reality of the surrender of British sovereignty that is embedded in Ms. May’s horrible deal. The animus of the EU’s leaders toward the UK is so strong that they may not be satisfied until they have kicked the British Royal Family out of Buckingham Palace and see them selling pencils and apples on Trafalgar Square.